PatientsLikeMe member mmsan66 was diagnosed with ALS back in 2008, but she’s been fortunate to experience an unusually slow progression, which currently affects only her legs. As a college professor, financial planner and ALS advocate, she raises awareness through her work with the Massachusetts Chapter of the ALS Association. She even finds time to visit places like the Grand Canyon, and she shared all about her life in a PatientsLikeMe interview. Read below to learn about her personal journey. What was your diagnosis experience like? What were some of your initial symptoms? I was diagnosed in 2008 at the age of 66 but, looking back, had definitely exhibited symptoms in 2007 or earlier. I had retired a few years prior, after a long career in Human Resource Management that included positions in the fields of health care, the Federal government, higher education (Northeastern University), and high technology (the former Digital Equipment Corporation). But, rather than slow down and enjoy retirement, I started a second career in tax and financial planning. I became an IRS Enrolled Agent (EA), earned a Certificate in Financial Planning, and obtained my securities and insurance licenses. I started my own business as a tax and financial advisor (Ames Hill Tax Services) and also began teaching undergraduate courses in Finance, Accounting, and Investments as an Adjunct Instructor at several local colleges and universities. I definitely noticed a change in 2007, when I experienced a number of falls (for no apparent reason), culminating in a fall while on vacation in Florida in which I fractured my left wrist. Upon returning home, I scheduled appointments with several specialists to have my legs checked out and, after a series of neurological tests, received a diagnosis of ALS at the Lahey Clinic in July of 2008. I wasn’t completely stunned, as I had done a lot of internet research on diseases with symptoms similar to mine, but had gradually eliminated them one-by-one as each test result came back negative. However, like all PALS, I was hoping against hope that my suspicions would prove false. The one thing that kept going through my mind in the days following my diagnosis was that my life—— as I knew it—– would soon be over. How has your ALS progressed over the past few years? In 2009, after learning that the average life span of a PALS was 3-5 years after diagnosis, my husband and I decided to sell our home of 36 years rather than modify it. Fortunately, they were in the process of building a luxury apartment complex on a hill in town, and we were able to move into a brand new handicapped-accessible apartment, complete with roll-in shower, and overlooking a pond complete with wildlife. By 2010 I was no longer able to walk at all, and had to rely solely on a power/ manual wheelchair, as well as a scooter. Although confined to a wheelchair, I still maintain my active tax practice, preparing individual, corporate, and trust tax returns as well as representing my clients at IRS audits. When I realized it would be too difficult to travel to and from the various campuses at which I taught, I applied and was hired as an online instructor by the University of Phoenix, where I’ve been teaching Personal Financial Planning since 2010. At this point in time, after living with the disease for 8 years, still only my legs are affected. Thankfully, I still maintain my upper body strength, and my ability to speak, swallow, breathe, etc. remains completely normal. Somehow, I can’t help but feel that this slow progression might be due in part to the upbeat, positive outlook I continually strive to maintain, and the fact that I keep very busy with my family, clients, students, attending online CPE seminars (to maintain my professional licenses), and participating in ALS fundraising walks. We read you like to travel – what are some things you’ve done to make traveling easier? We’ve done some travelling since I’ve been unable to walk, but nothing extensive in the last couple of years. Our last long-distance trip was to Las Vegas, the Grand Canyon and several other National Parks such as Bryce and Zion. At the time, however, I was still able to transfer with my arms from my wheelchair into the passenger seat of our van. Now, since my legs are completely useless, a handicapped van is a necessity. We will be going to Austin, Texas in October for a niece’s wedding. We’ve found travelling is a lot easier if you call ahead to lay everything on with the airlines. Reserving a wheelchair or a power chair at each destination makes things a lot easier. And, it’s of the utmost importance when making hotel reservations to specify a “wheelchair accessible” room, not just one that’s “handicapped accessible” (a motel that has a roll-in shower is the best!). Also, contacting local ALS organizations in the areas you plan to visit well in advance can be very beneficial. They can direct you to rental agencies or, better yet, lend you the mobility equipment you will need while you’re there. Can you tell us a little about your work and advocacy with the Massachusetts Chapter of the ALS Association? In addition, I have spoken to groups at various other fundraising events sponsored by organizations such as ALSA, the ALS Therapy Development Institute (ALSTDI), etc. 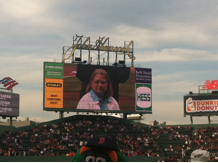 and have represented these organizations at ALS Awareness events at Fenway Park. Because of my visibility as a PALS, I was elected to the Board of Directors of the ALS Association’s Mass chapter, and currently serve in the capacity of Secretary. What have you learned about yourself that has surprised you and/or your loved ones? I think the first and foremost thing I learned, is that the human spirit is more resilient than we think. I would never have imagined that I could be diagnosed with such a terminal disease, and still continue on with my life as best I could, finding pleasure in simple daily activities. 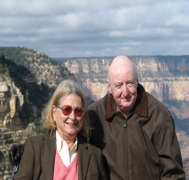 We had travelled extensively around the world in the early years of our 47-year marriage (lived in Hong Kong for 2 years) and planned to travel internationally once again once we retired and our daughter embarked on a career of her own. Now, I appreciate just being able to get into our handicapped van and take local day trips with my husband. Never mind viewing the Taj Mahal by moonlight, now an excursion to the grocery store or taking in a local college hockey game is a welcome diversion and takes some planning.